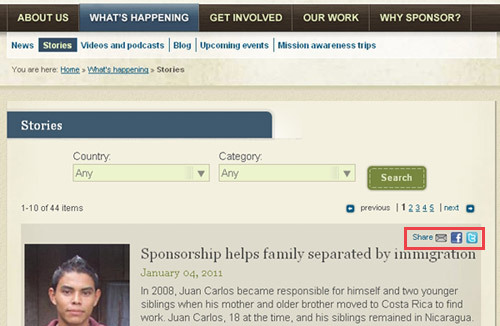 Have you noticed the “Share” feature on our website? We’re pleased and proud to give you the option to share our news, stories, videos and podcasts with your friends and family on several online and social media channels. In the screenshot above from our “Stories” page, you can see the share feature highlighted in red. Just click on any icon as needed ñ the envelope for email, or the Facebook and Twitter icons. Thanks for all your support, and for sharing your CFCA experiences with others. We spend only 2.8 percent of our total revenue on fundraising. Most of the time people hear about us through word of mouth or, as in a growing number of cases, through social media.